gathered her children around her, and turned on the gas. sons grew up to have a real impact on their city and state. of latitude in the biographical information they give on a website. their mother made her momentous decision to live. for Presidential Elector for California. the area with his campaign materials. hiring an African-American deputy, Gilbert Lindsay, early in his term. arrived at the airport in 1961.
another brick, and Kenny steered the car to safety from the back seat. family lived there, he refused. and to and from Martin Luther King Hospital. trumpet in his private Lutheran high school. parade to welcome the Dodgers to Los Angeles. orders fed his interest in public service. the Los Angeles District Attorneyâ€™s office. €™s office is one of the largest in the nation. the acquittal of the officers who beat Rodney King in 1992. €œIt looks like the LAPD has abandoned the city,â€� he said. public office is a public trust. Los Angeles into financial difficulties. €™s rhetoric that rivals his fatherâ€™s. stronger LAPD, more after-school programs and less graffiti. Pedro, where he lives with his teenage children, Karina and Jackson. the dog and watering the garden, the family enjoys dirt biking together. As Roderick points out, â€œBeing Mr. Mayor is his job, not his life. 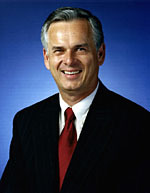 Neighborhood Councils were among his accomplishments as mayor. reelection by Antonio Villaraigosa in 2005.
living wage and to clean up toxic sites. and Girls Club, and the South Bay Workforce Investment Board.